Elijah Montgomery Du Pont is the future mayor of Charleston. From his military career to city hall, every detail of his life has been meticulously planned. Until now. His only respite from life's sudden upheaval is Addison, his new, improbable best friend. She makes him happy. Grounds him. And public disapproval be damned, he's not willing to give her up. But with an election on the line and public pressure rising, Addison—and the cruel hand of fate—might not give him a choice. I need more of this couple or at least a follow up with Naomi. 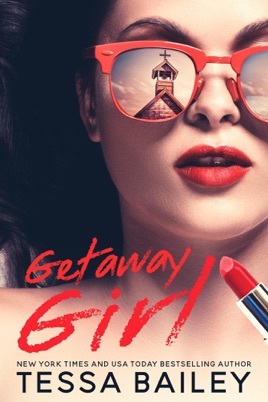 Getaway Girl is hands down the most unique best friends to lovers story I have ever read. The gist of the plot is one I’ve read before, but absolutely NOT in the way that Tessa Bailey weaves the story of Addison and Elijah. These are the characters we are usually narrated to dislike, but Tessa takes the groom and the getaway girl and makes them so easy and fun to root for! I appreciated this side of the story. Addison is quirky and fun. Shes like every holiday smushed into one person. A kaleidoscope of personality that she keeps hidden until the perfect moments. She’s so easy to root for and defend from harsh characters in the book. Elijah.. oh sweet, huge badonk Elijah. He is southern sweetness mixed perfectly with the right amounts of alpha. He’s a good human. He tries to be a good human at least. Even though both of these characters have ups and downs they work together to be better. Addison and Elijah are two puzzle pieces that fit perfectly, and their story is just so so good. Full of witty banter and inner monologue, small town drama and community, characters you will fall so easily for. I can’t say enough good things about this book. I need to stop because at this point I’m just rambling. Tessa Bailey knocked it out of the park. PS - I would LOVE LOVE LOVE Naomi’s story. I mean she is the runaway girl. What is a getaway girl without one of those?